Need more information about booking Home 275199 ? The Granary Cottage is a classically charming and yet spacious 2 bedroomed stone cottage. It is fantastically located only 10 minutes from one of Cornwall's best surfing beaches and just a few miles from the delightful Cornish town of Bude. Hidden down a secluded drive the cottage offers both peace and easy accessibility. The cottage is set within a private courtyard of three cottages. The cottage has been equipped with everything you would expect to find in a home from home. Particular care has been taken when selecting beds and sofas to help ensure a comfortable and relaxing stay. Previous guests have commented on how comfortable and well equipped the cottage is. Guests staying at The Granary Cottage have free access to the 75 acre estate. There is space in abundance with places for picnics and kite flying, streams, woods and mud, all making it a great location for a family holiday. There are walks from the estate to places like English Heritage's Penhallam Manor, and some wonderful cliff top walks along the coastal path. Quiet nature lovers may get to see some of the amazing wildlife that lives on the estate including: Barn Owls, Bats, Deer, Badgers, Foxes, Buzzards, Peregrine Falcons, Woodpeckers, Moles, Hares, Rabbits, Tawny Owls, Jays, Wagtails and occasional Otters ( to name just a few). The woods and hedgerows are filled with wild flowers and give a lovely changing scene throughout the year. Cyclists love the fact that we are located just off National Cycle Route 3 and very well located to many other fantastic cycle routes and trails. We have places to store bikes and connections with cycle hire shops who can loan bikes or service your own. We are recommended by 1sw- the cycle website. The North Cornwall coast is on our doorstep making this an excellent location for surfers and body-boarders or those wishing to build sand castles and investigate rock pools. We are only a short drive from many amazing beaches and secluded coves. We have a wash down point to de-sand you when you return and plenty of undercover provision for storing boards and drip-drying wetsuits. We recommend using a car or bicycle during your stay. Bikes can be hired locally and we are just off the national cycle route. We understand that our guests like their privacy. We generally communicate by text and are on hand to help if you have any problems during your stay. Stoneleigh Knowle is set in stunningly peaceful grounds - no sounds apart from wildlife and no light apart from what you generate at the cottage. It provides its own lovely walks that give a feel of adventure through long grass and woodlands. Near by are all the attractions of Cornish cliffs and beaches; Cornish pasties and ice cream for a treat after long treks up and down the cliff top paths. Perfect antidote to the hustle and bustle of life in the hectic South East. We spent a wonderful bank holiday weekend at the Granary with two children and our dog. It is in a perfect location, as it feels like you are in the middle of the country while being really close to all the amenities. Rebecca could not have been more friendly and helpful too, her tip about the quirky cinema nearby was fantastic for the one rainy day we had. The cottage was decorated to a high standard and we all slept soundly in the very comfortable beds. Stayed at the Granary in a very sunny week in May, we had an amazing time. 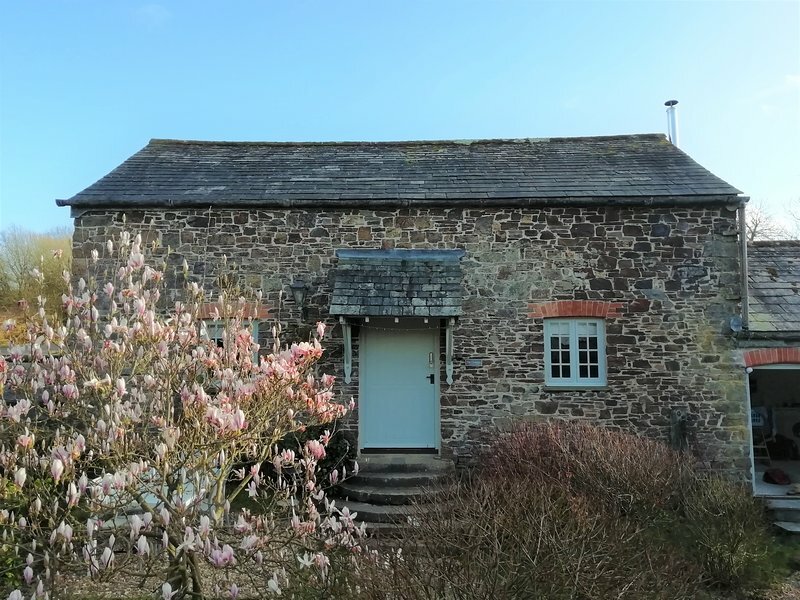 The Granary has all the comfort you could want and is located out from the hustle and bustle, but close enough to all amenities, the surrounding grounds are pretty and it hard not fall in love with North Cornwall. It's only a short drive to the nearest beach and Bude is only 10 minutes away. Rebecca is very helpful and made us feel really welcome, giving us some great suggestions of places to visit. Its peaceful and quiet, came back home feeling very relaxed and look forward to going back again. We thoroughly enjoyed our stay in this homely cottage, it is quiet and peaceful but not far from all amenities. Its extremely clean and has been decorated & furnished very tastefully.Rebecca is very friendly. You can get in touch with Rebecca (the owner) through the contact form on this page. Send Rebecca (the owner) an email through the contact form on this page. Alternatively, if there’s a phone number on this page, you can call them. How do I contact Rebecca (the owner)? If you’ve already booked, go to Manage your holiday booking to view Rebecca the owner's contact details or send them a message. Or send Rebecca (the owner) an enquiry through the Contact the owner/manager form if you’d like a quote or more info first. When you pay online through the Book your stay form, a booking request is sent to Rebecca (the owner). You’ll find out within 24 hours whether they’ve accepted - no money will leave your account before then. You can also request a quote from Rebecca (the owner) through the contact form. The owner will email you the total cost for your dates and a link to book and pay online. Use the Book your stay form to pay provisionally online. You can pay by credit/debit card or PayPal. Rebecca (the owner) will have 24 hours to accept the booking and no money will leave your account before then. Why can't I call Rebecca (the owner) before booking? You’ll need to contact Rebecca (the owner) to do this. Send them a message in Manage your holiday booking or through the contact form on this page. You can request to change the dates or number of people on your booking via the Manage your holiday booking page. To change your holiday dates use the Edit booking button. If you need to change the number of guests staying then send Rebecca (the owner) a message. If Rebecca (the owner) agrees, they’ll send you a revised quote outlining the changes. You can review and accept/decline this from the Manage your holiday booking page. You’ll have 48 hours to take action before the revised quote expires. Estimated price per night based on a weekly stay. Owner fees of $59.00 per stay may apply. Enter your dates to see the total cost.